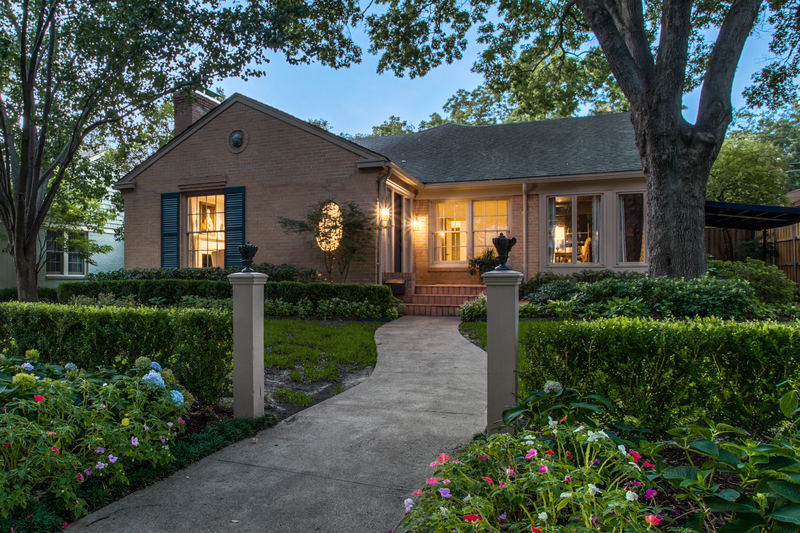 Situated on a gorgeous street in prestigious West Highland Park with beautiful landscaping and mature trees with tree lighting, 4624 Lorraine Avenue is a stunning clean lined transitional cottage nestled on a 60’-wide lot and has fabulous drive-up appeal. The property also includes the City of Highland Park Fire, Police and Emergency Services. In keeping with the timeless charm of the original home but completely updated with luxury amenities designed to pamper the most discerning homebuyers, details include a brick exterior, open floor plan, expansive entertaining rooms with elegant proportions, handsome hardwoods, deep molding, sound system speakers, light-filled windows providing an abundance of light, chic custom drapery and wall coverings, plus wonderful marble and granite finishes, including the finest of tile from Ann Sacks. Visually captivating and impressive, the large lot is accentuated by caressing mature lighted trees and curvilinear planting areas lead to the front of the home. Exuding modern elegance with its sophisticated chic interiors, the stylish one-story residence is perfect for entertaining with its open floor plan graciously leading to the rear of the home and outdoor living space. The well-appointed home offers approximately 2,273 square feet, two luxurious bedrooms, two baths, an inviting front foyer, elegant formal living room, spacious open granite kitchen boasting premier stainless appliances, including a breakfast bar, large morning room and also opens to an oversized family room with a formal dining area, featuring a soaring 12-foot vaulted beamed ceiling, brick-surrounded fireplace, light-filled French doors opening to the outdoors and a fully equipped wet bar with a Uline stainless steel ice maker and refrigerator plus a fabulous temperature controlled wine room, a spacious study surrounded by windows with stylish drapery, brick flooring, built-in bookcases and also opens to the front side driveway, with a carport and its new covered awning, a luxurious oversized master suite highlighted by gleaming hardwoods, abundant built-ins, and an elegant marble bath, accented with gorgeous Ann Sacks marble herringbone mosaic tile floors, a huge walk-in closet, and light-filled French doors conveniently opening to the patio deck area, a generous-sized guest bedroom with a pair of large closets and served by an adjacent elegant limestone bath with exquisite wall coverings, and a large utility room. Outside, the backyard grounds set the tone for a sophisticated atmosphere for entertaining. An exceptional outdoor entertaining area features an expansive patio deck area overlooking lush landscaped grounds framed by gorgeous flowering crepe myrtle trees and an inviting vaulted covered pergola. A carport and nearby storage shed, with abundant storage space, completes this stunning home. You will be surprised by the phenomenal use of space within this fabulous residence. Every room is spacious and open, and there isn’t an afterthought in one square foot of the home. It was designed to make the homeowner feel special!